Wow, we seriously cannot believe that recruitment is around the corner for so many of you! 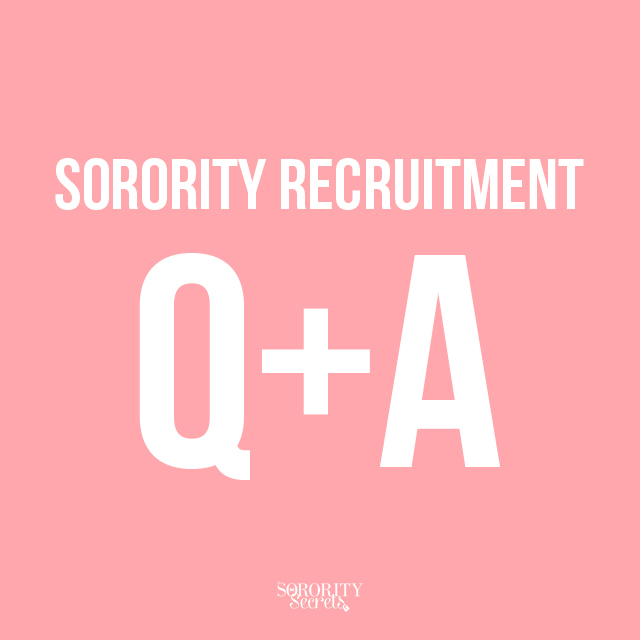 We have received a lot of personal messages from women eager to learn more about joining a sorority so we decided to provide you all who are interested in going through recruitment with a little Q&A. Find the questions and answers below. If your question wasn't answered, then please leave your question(s) in the comment's section below! Q: When is sorority recruitment? A: It all depends on what school you're attending! Typically, recruitment is hosted in the summer time at the beginning of school (few sororities also do it in the spring). Be sure to check your college or university's main website and locate where the sororities are categorized to identify when recruitment is. You can also try to find the National Pan-Hellenic Council (NPHC) or National Panhellenic Conference (NPC) sites to get that information. A: The National Pan-Hellenic Council is comprised of nine of the historically African American, international Greek-lettered fraternities and sororities. 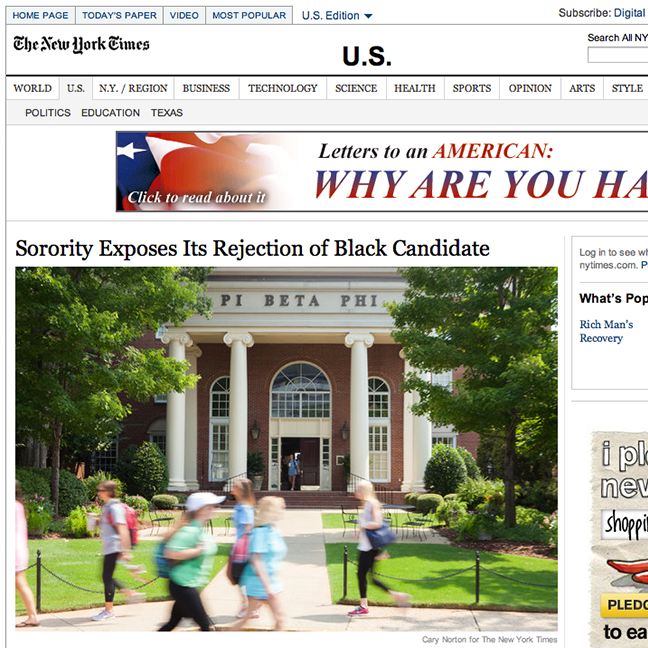 These frats and sororities are also collaboratively referred to as the "Divine 9". The National Panhellenic Conference encompasses 26 (inter)national women's sororities. Q: What does "pledge" mean? A: Pledging a sorority means committing to getting to know a particular sorority. Being initiated would make you an official sister/member of that sorority. Q: How does recruitment work? A: Depending on what type of sorority you choose to pledge (an NPHC sorority or an NPC sorority) most of the sororities host a formal 3-4 day recruitment process where you get to visit each sorority, talk to the girls, and rank which sororities you would like to learn more about and revisit. Eventually, you narrow it down to 2-3 sororities and you attend an exclusive night with each potential sorority before you make your final decision. The following day, typically called Bid Day, you find out which house wanted you (and you wanted them) It's the best feeling ever. Q: Should I go through recruitment my Freshman year or my Sophomore year? A: We can only speak from our experience and say that going through recruitment our Freshman years was the greatest decision we could have ever made. It simplified the struggle to find friends in such a big college world because we already had so many friends to choose from making the memories of our first year in college nothing short of amazing. On the other hand, we know several women who opted to do it their second year in college and they too had a blast gaining new lifelong friends. Ultimately, it's up to you! Q: Is joining a sorority super expensive? A: Joining a sorority will certainly cost money to maintain, no different than the monthly payments you make for the other bagillion things you love. 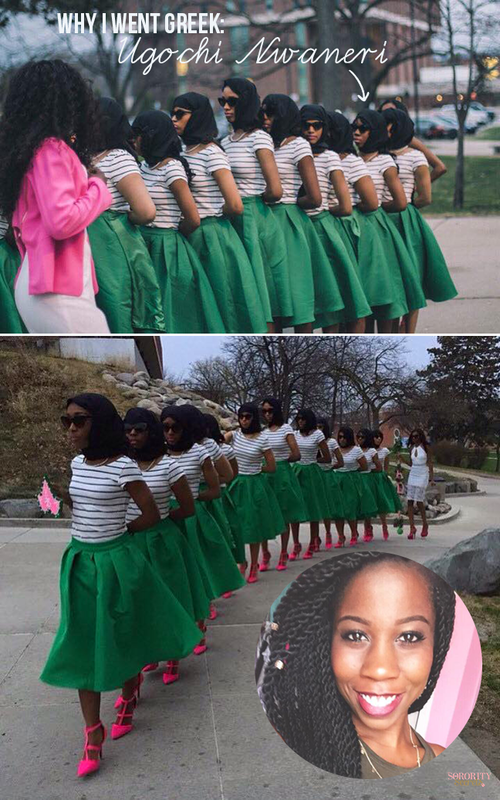 There is no amount of money that could pay for the amount of friendships and memories that you will develop during and after your time as a soror. In any case, properly budgeting will make it possible for you to actively participate. Many sororities can also offer you payment plan options so don't let money get in your way of making lifelong friendships. What other questions and comments do you have about recruitment? Leave your questions in the comments below! The trend of recruitment videos is on the rise. 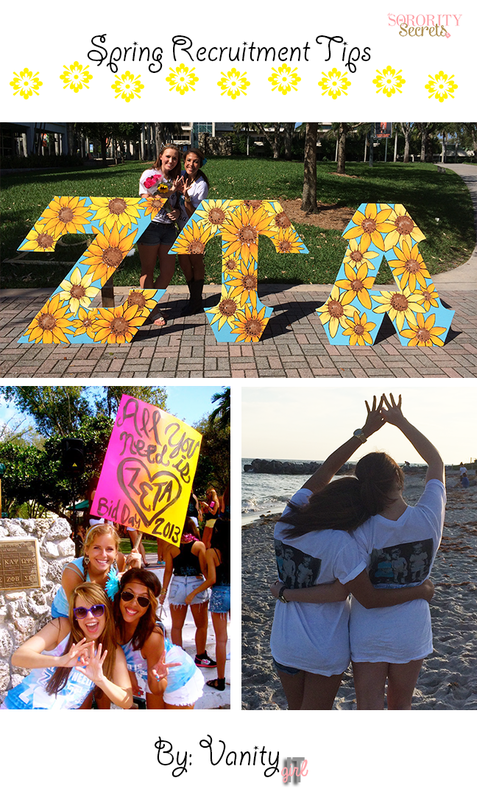 Chapters nationwide are taking part, and creating videos to share in the excitement of recruitment season! They can be a great tool for recruitment as well. We posted some favorites a while back, to check out for inspiration! Our first video has some great ideas too. But what exactly makes for a great recruitment video? What tips can your chapter use to set your video apart from the rest? We've compiled 10 essentials to help make your video the best it can be! Music sets the tone and mood for the video. Go with something energetic to amp it up (check out our Summer Playlist & EDM Workout Playlist for ideas), and infuse it with more mellow tracks to add emphasis to sentimental parts. Your videographer can often mix songs together to do this, to transition from mood to mood. Adding a small break in the video (such as fading the screen to white and then coming back on again) can help to make the shift in moods easier between segments. Or, pick one song the whole way through and stick with it. There are plenty of great songs out there, so you can pick one that's uniquely yours! Pay attention to the lyrics in the songs to make sure they fit the tone you're trying to get across. At the end of the video, you can add credits to the songs you chose. Lighting is everything! If you're going for outdoor shots, lighting is best either in the morning or mid to late afternoon. Direct sunlight during lunchtime hours (from 11:30am until about 1:30pm) can be harsh, and can create unwanted shadows. Plus, you don't want to be squinting from the sun! Shoot outdoors during prime lighting hours, and you will capture the natural "glow" that makes everything look magical. Who are you? What is your chapter all about? Be sure to include this in the video, and capture the essence of who you are as a sisterhood. 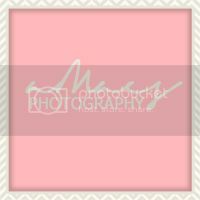 Being in a sorority isn't all about perfectly staged glamour shots either, so be sure to include shots of simply being yourselves-- who you are on a daily basis. This adds personality and authenticity to the video. Adding a message from the president or recruitment chair, even a few sentences, makes for a personal touch. This can be accomplished as either a voiceover (paired with different footage while she's talking) or as a direct interview where she's seen talking to the camera. She can also look slightly away from the camera, to give the look like she's talking to someone else. Not all of the interview needs to be shown; your videographer can edit the interview to include the best highlights. Other chapter members can also be interviewed, and pairing sisters off (such as a big/little duo) to show their personalities is great too! The background music can fade down during these parts, so it's not completely off while you listen to people speaking. If you're shooting inside your chapter house, make sure things are looking as clean as possible. Be mindful of any eyesores (such as garbage cans, trash, or messy piles) laying around, so you can move them out of the shots. Think of the little details too, such as clean nails. Not everyone needs to run out and get a manicure, but make sure that your nails are dirt-free! Videos are a great time to show your creativity. Think of shots that are outside the box... not everything needs to show smiling faces. Think close up "moving picture" shots; such as things hanging on the walls, t-shirts you have created, accessories, arms linked together from behind, you get the idea. You can also infuse black & white footage, or "Instagram" like filters or colors in certain scenes. Put together some sort of storyline, so the video has a clear concept from beginning to end. Capture the moments, get candid. Be silly. Adding some "behind the scenes" footage or "bloopers" can add an element of fun to the video! It shows who you are, and that you don't take yourselves too seriously. Laugh, smile, feel the happiness that is your sisterhood. There's nothing like true happiness... and when it's captured on film, it's pure magic. Plan out any looks or outfits prior to shooting the video, so you're not racing to put outfits together last minute. Go for a color scheme, or similar accessories. Not everyone needs to look like an identical cookie cutter either... your sisters can showcase their own personal style, while still looking visually cohesive with the group in the video. Take a bohemian theme for example; flowy tops, jeans, shorts, maxi dresses, kimonos, floppy hats, turquoise jewelry, flower crowns... it all works! Videos should be just long enough, but not too long. Keep it under 3-4 minutes, so you keep your audience's attention. Even better, keep it under 2 minutes, and you'll leave your viewers wanting more! Edit the scenes, so you're left with only the footage that truly is the best. Do you have any tips for a great recruitment video? Share with us below, and also be sure to share your videos with us as well! We would love to see! It's the most wonderful time of the year! Nope, not the holidays... recruitment! That's right, Bid Day and meeting the new additions to your chapter are right around the corner. But before that can happen, recruitment needs to happen first. It's time to get dressed up, sing songs, possibly lose your voice, and spend a few long days & nights with your sisters! In all seriousness, recruitment really is our favorite time of the school year. And, we can't forget what's most important here... the potential new members (aka PNMs). Yes, it can sometimes feel like friendship speed-dating. But, you're on a mission to make a connection; you're on a mission to find your new sisters. 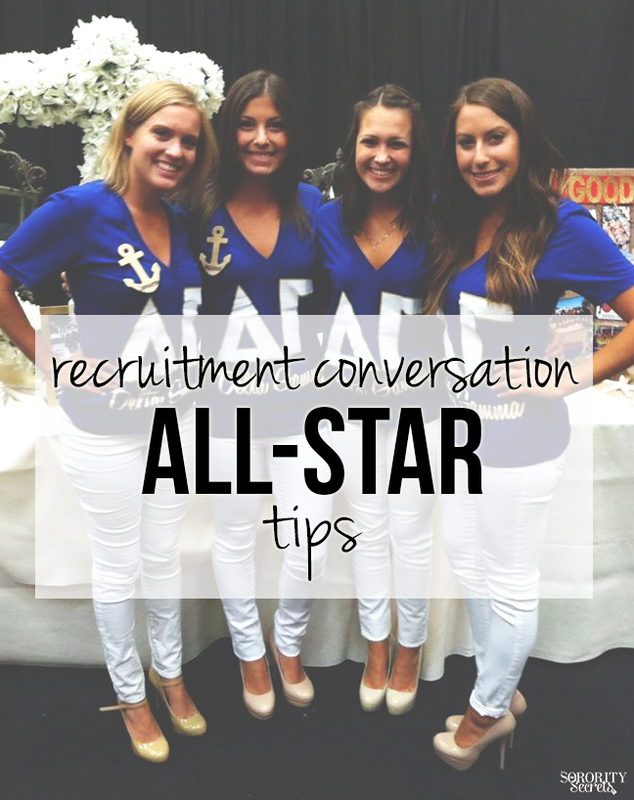 Keep our key tips in mind, and you'll feel like a recruitment conversation all-star in no time! When talking to the PNMs, your goal is to get to know them. Make a connection! 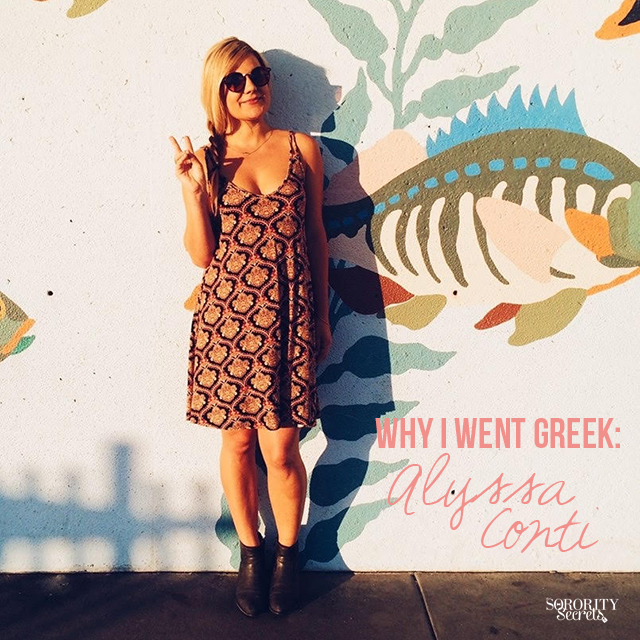 Find out who she is, beyond just her major and what hometown she's from. What are her interests? What's her group of friends like from high school or back home? What activities or hobbies does she enjoy? Share a laugh together, break the ice. Let her feel invited to share more about herself with you. Tell a personal story, and encourage her to do the same. Get to know who she is beyond the surface. Your warm & friendly attitude will help for both of you to feel more comfortable and natural, in a setting that can sometimes feel otherwise. Ask open-ended questions. The PNM's replies should require more than simply a "yes" or "no" answer. Take that question, and roll with it! Lead it into a conversation. Talk to her like a friend, where you each share your thoughts. Nobody likes to have questions fired at them (which feels more like an interview) so talk about each topic a little before moving on to the next. If you can tell she's not enthusiastic about the topic at hand, be prepared to lead into something else. Find common ground. Don't focus on "selling" your sorority too much; focus more on getting to know her. Ask her where she's from. Lead it into a conversation about where she's traveled to, or any other places she has lived over the years. Ask her how recruitment is going, how she's liking it so far. What made her want to join a sorority? You can share how you felt going through recruitment (keep it positive & neutral), and why you wanted to join a sorority. What made her want to come to your university? Is she living in a dorm? An apartment? Does she have a roommate? Ask her how she likes it. If you lived in a similar dorm or apartment, you can share about it too. If the topic goes well, you can ask her how she decorated it! What are her friends like back home, or from before coming to college? This can lead into talking about how your organization can provide great friendships. Make it personal-- mention the friendships you have made, and what they mean to you. And in general, friends are a safer topic than family. Did she play any sports or do any activities in high school? Talk about it. For example, if she played volleyball & your chapter has an intramural team, she would probably love to know! A sincere compliment on something she's wearing is great when you truly mean it. Be mindful to not talk about shopping/clothes for too long, and lead into another topic that will help you get to know each other in a more meaningful way. A good icebreaker: favorite places to eat around campus. The "what's your major?" question is bound to happen, but try to not rely on it too much (especially after the first day of recruitment, she's been asked many times by then). Your topics should be a well-rounded balance of school, fun, and friends. After all, your organization is well-rounded too! Partying, guys, bad words, etc... avoid them, as you probably already know! Gracefully change the topic if it gets brought up. There is so much more to friendship & sisterhood other than these topics, and that's what you're trying to get to know about her in a short amount of time. Is the PNM funny & quirky, and you're funny & quirky? By all means, be yourself! Keep the conversation appropriate, and you're golden. Once you break the ice, treat the conversation as you would with an old friend. Give the PNM your genuine undivided attention. Let the topics flow easily. Be authentic. Connect with good eye contact. This will help both of you to be your true selves, and will also help both of you decide if your chapter is her home sweet home. No matter what, there's one rule of thumb-- be kind. Be polite, be respectful, be gracious. Treat each PNM you meet with genuine kindness, and you're already an all-star. Great conversations make you & your house stand out, and leave a positive lasting impression for everyone! Sure, recruitment can be stressful at times. But more than anything, remember how much fun it is too! It's an honor to recruit the new members that will carry on your chapter's legacy long after your graduation. Enjoy the little moments, and each conversation. You'll be celebrating with your new members at Bid Day before you know it! We're feeling totally inspired by all of the creative recruitment videos out there. Some are sentimental, a lot of them are hilarious, and others just flat out make us want to dance! All in all, these videos are a celebration of the sisterhood that we love so dearly. It's clear that chapters all across the country have a lot of talent when it comes to putting together clever videos. Plus, the music selection is pretty amazing too! To start, we love all of the sisterhood going on in this video! The laughs, the smiles, and beautiful pictures capture the spirit of this chapter. What really makes this video special is the heartfelt interviews sprinkled throughout, describing various chapter members' personal experiences in Chi Omega. And just wait until you see all of the positive energy in the last minute of the video... we're blown away! This one has been out since 2011... but we still can't get enough! These girls can dance, rhyme, and bust a move. Honestly, how brilliant are these lyrics?! This song is so catchy, we're probably going to be singing it all day long. Just the first few seconds in, we were sold... their house mom might be the most adorable person ever. We love the originality of this song! Plus, the shots of everyone letting loose and letting their personalities shine can't be beat. Totally an authentic-feeling peek into the lives of these fun ladies! The intro to this video is all about the candids; the singing & dancing in the bathroom is totally something we would do! About halfway in, we love the change in tone, when the ladies describe "what Alpha Phi is." A safe haven, living with my best friends, and future bridesmaids... many of the things that we cherish as Greeks! This video. WOW. We laughed, we cried, we got goosebumps. And when we say we cried, we mean it... TSS Co-Founder Ali definitely shed some tears when the girls ran to each other after receiving their bids. The spirit of bid day, captured on film! 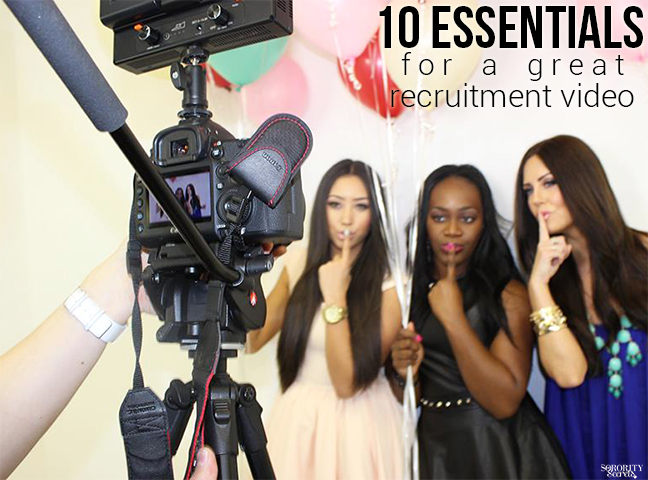 And there you have it, some of our favorite Recruitment videos of all time! No matter what the letter, we truly are all Greek together. Does your chapter have an awesome recruitment video that we need to see? Share it with us below, we would love to watch! With recruitment just around the corner, a lot of you may be asking yourself “what do I wear? !” Keep calm; we are here to help! While sorority recruitment is so much more than the volume of your hair or what designer you are wearing, it is still important to care about your appearance and be confident, because a first impression can be a lasting impression. I have come up with some tips to help you put your best self forward and stand out in a crowd. Your outfit can say a lot about your personality. In any situation where you do not know what to expect, or you are meeting hundreds of people for the first time, it is best to keep it classy with higher necklines and longer hems. This Laundry dress is classic and colorful. The jersey material is soft and comfortable, and won’t wrinkle so you stay looking put together all day! You know that gorgeous statement necklace or cute headband that you always get complimented on? Accessorize! Adding a pop or color or statement piece to your outfit is a great way to make yourself stand apart and be unique. It can also be a great conversation starter because everyone will want to know where you got it! This aqua statement necklace or pink Tory Burch flats are sure to be remembered. Although recruitment is so much fun, it is also a very long and exhausting process. We have all had those nights where our new heels are killing us and we are asking everyone we know if they have a band-aid for our blisters; comfy footwear is key! Heels are great, but make sure that you can walk and stand in them all day! A wedge can provide more support and adding Dr. Scholl’s Foot Cushions to any high heels can be life changing. I would recommend breaking new heels in around the house! It’s always better to be overdressed than underdressed. Don’t be afraid to get dressed up, especially for the last day of recruitment! Think like you're meeting your boyfriend’s parents or going to a job interview. That special outfit or your favorite cocktail dress? Wear it! I love this fun and flirty Parker dress. It is elegant and classy, but still unique and memorable. The most important thing to keep in mind is to be yourself and make sure that you are comfortable in any outfit before walking out the door. When you are comfortable, you are confident! Wishing you all the best of luck in recruitment!